For future managers, the fast-paced world of technology offers both unlimited opportunities and difficult challenges. Understanding what the laws are, why they're important, and how they apply to cyberspace will help you to make better decisions. 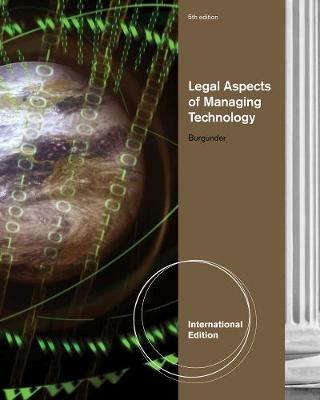 LEGAL ASPECTS OF MANAGING TECHNOLOGY, 5e, INTERNATIONAL EDITION guides you through the complex legal issues involved with today's rapidly-changing technology environment. This book offers a comprehensive presentation of intellectual property rights and solid coverage of other key topics including ecommerce, privacy, antitrust, and biotechnology. This edition's lively, intriguing writing style is packed with actual examples showing how real companies throughout the country analyze and apply legal concepts.